This pasta bowl was inspired by the fennel bowl I enjoyed at Shouk and wrote about earlier this week. That dish, which is vegan, contains brown rice, lentils, fennel, other vegetables and a wonderful pistachio pesto with a Middle Eastern spice profile. This dish is not vegan or even vegetarisn--it contains bacon (easily omitted if you want to make the dish vegan)--and it has a more Italian than Middle Eastern flavor. These kinds of bowls make a great dinner, ideal for breaking up a midweek routine. 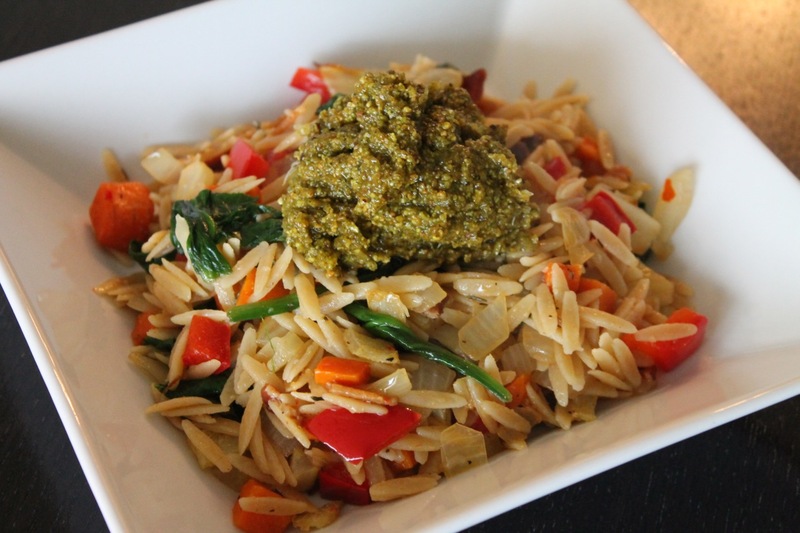 Inspired by the fennel rice bowl at Shouk in Washington, D.C.; pesto adapted from a recipe by Frank Falcinelli and Frank Castronovo for Food & Wine. 1. Cook orzo in salted boiling water according to package directions for al dente. Reserve 1/2 cup of pasta cooking water, drain and set aside. 2. Preheat oven to 425 F. Combine fennel and carrots in a large bowl. Drizzle with 2 tbsp. of olive oil. Toss to coat and season with salt and pepper. Spread vegetables on a baking sheet and roast until softened and lightly browned, about 40 minutes, stirring after the first 20 minutes. Set vegetables aside. 3. Make pesto while the vegetables roast: Add the pistachio nuts to a food processor and pulse a few times to coarsely chop. Add the mint and garlic, then turn on the processor and drizzle the olive oil through the feed tube, processing the mixture until it forms a paste. Transfer mixture to a bowl and stir in the pecorino romano cheese. 4. Cook bacon in a large saute pan over medium heat. Transfer cooked bacon to a paper-towel-lined plate. When cooled, transfer to a cutting board and chop into bits. Pour off the excess fat from the saute pan, leaving about 1 tbsp. in pan. Return to medium heat and sauté the onion and red pepper until lightly browned and softened, about 10 minutes. 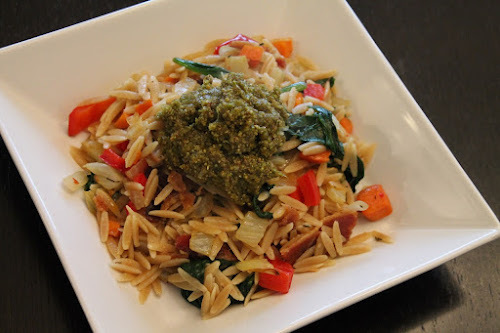 Stir in the spinach and cook a couple of minutes until it wilts, then stir in the cooked orzo, bacon and roasted vegetables. Moisten the mixture with some of the reserved pasta cooking water. Season to taste with salt and pepper. Serve in shallow bowls topped with a generous dollop of pesto.